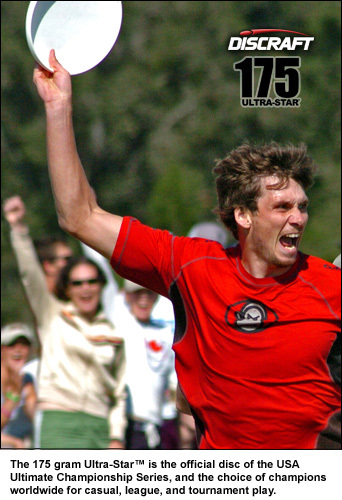 Discraft is passionate about Ultimate, and that's why the Discraft 175 gram UltraStar has been the world standard for Ultimate since 1991. Today there are 4.9 million Ultimate players in the U.S. alone, and virtually all of them throw the UltraStar. 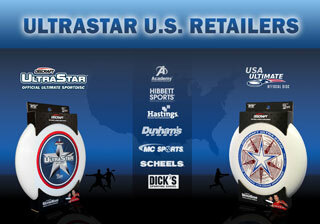 Discraft's 175 gram UltraStar Sportdisc was created and introduced to tournament play in 1981. 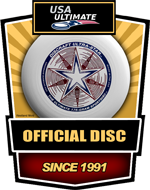 Ten years later the UltraStar was selected as the official disc of USA Ultimate, a position that it has held for over 20 years. 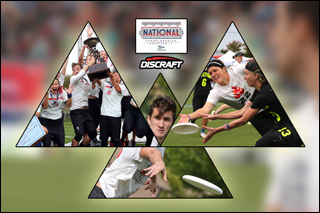 See why this disc is used for every USAU championship event around the globe. Learn the basics of the game. Show your spirit with Ultimate t-shirts, hats and other gear. 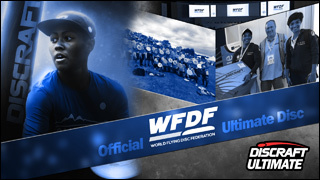 Discraft's 30+ year commitiment to supporting the efforts of WFDF continues. Photo highlights from Rockford, Illinois. Photo highlights from Blaine, Minnesota.